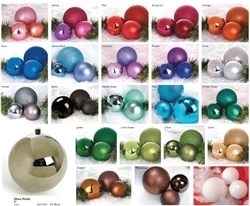 330 MM Shiny Or Matte Finish Ball Ornaments. Sold (1) per box. Shiny Finish or Matte is the same price. Call us before you order to make sure the colors you want are in stock. 13 1/4" T X 26 1/2" in diameter. Colors Available: Pink - Cherry - Red - Burgundy - Orange - Blue - Gentle Blue - Lavender - Purple - Lime Green - Green - Silver - Olive - Pewter - Black - Gentle Green - Teal - Hunter Green - White - Gold - Copper - Chocolate. If you want Matte Finish add it in notes at check out.